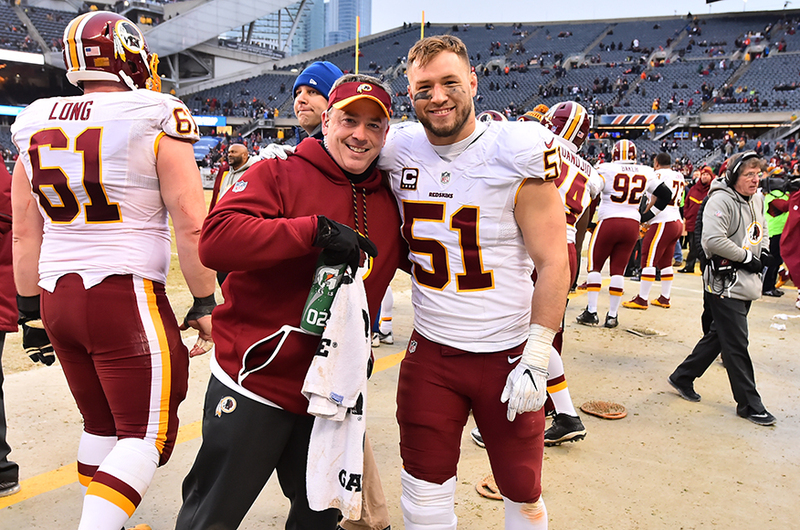 On a typical weekday, Elliott Jermyn, PT ’01, ATC, rises before the sun and makes his way to Redskins Park in Ashburn, Virginia. As the clock strikes 7 a.m., a slew of National Football League (NFL) players enter the training room; maybe quarterback Kirk Cousins, or outside linebacker Ryan Kerrigan, possibly wide receiver Jamison Crowder. As the men shuffle in, Jermyn, the Redskins’ physical therapist (PT) and assistant athletic trainer, gets to work. While at GW, Jermyn pursued outpatient orthopaedics. With a goal of opening his own practice, he asked GW’s faculty if his internships and residencies could be in the orthopaedic setting. They obliged him. A series of orthopaedics jobs following graduation from GW in 2001 ultimately led to a six-year stint at Precision Health & Fitness in Bethesda, Maryland. But then in 2008, football again came calling. The Washington Redskins were looking for a new physical therapist who also was a credentialed athletic trainer. Jermyn fit the bill. Fast-forward more than a decade and Jermyn says he couldn’t imagine working anywhere else. “I’m very happy that I made this decision. It brought me back to an area that I didn’t know I’d been missing,” he says. During games, Jermyn and the other trainers are “glorified water boys,” he jokes. They keep everyone hydrated, but always with an eye on the field, grabbing players who come off who may need some soft-tissue work or manual manipulation. “Even though it looks like we have the best seats in the house, and we do, we’re pretty darn busy on game day,” he says. Among the most common injuries Jermyn treats are those in the knees, such as meniscal tears; shoulder troubles, like acromioclavicular joint separation or labral tears; and ankle pain. Then there are the drastic injuries. Jermyn recalls a player who tore his brachial plexus, the network of nerves that sends signals from the spine to the shoulder, arm, and hand. He’s also seen lower leg fractures, and occasionally an open fracture where the ankle is pointed in the wrong direction. That’s one of the challenges, having a person who in any other setting might not even be walking, but who actually needs to be prepared to play an NFL game, Jermyn says. But the chief concern is the safety and health of the players, and getting them back onto the gridiron can take longer than they’d like. “Sometimes you have to step in and say, ‘you may feel good, and you look good, but safety-wise, you’re not ready to go,’ ” Jermyn notes. Those are the hard times, along with the 80-hour workweeks and lack of weekends. But then there’s Sunday. Many people spend that day looking ahead to the workweek, but Jermyn and his team are thinking back to their efforts from the week before, and — with every yard gained or touchdown made — knowing it was worth it. After a loss, “you come in to work, and you almost can’t look anyone in the eye,” Jermyn says. “And that’s everyone, the secretaries upstairs, the chef and his staff; it’s like a death march.